I have too much stuff. It’s likely that you do too, but I guess that’s beside the point. This is the time of year when new things arrive at my house (okay, to be more truthful, I bring them in) and I become more aware of how much stuff I have. I just read the Mayo Clinic staff list of characteristics of hoarders and am relieved that I only share three out of 11: “keeping stacks of magazines” (the clinic staffers don’t mention “The New Yorker” by name), “difficulty organizing items” (I never know what to do with perfectly good remnants of paper cut in the process of making greeting cards), and “perfectionism” (this is exemplified by my pile of homemade Christmas cards that may or may not be sent because a piece of paper has been crookedly glued or I’ve discovered an ink smear on the back). I always feel more anxious amidst clutter, so the Season of Giving also becomes my Season of Ridding. Thus far I have identified three very old and long-time favorite blouses with fraying seams and tears that I cannot repair and have stuffed them in a paper bag, awaiting the last act of courage, i.e, placing them in the garbage bin. I now see that a fourth quality on the hoarders’ list — “excessive attachment to possessions” — comes into play as I really hate to give up these blouses. However, given the potential embarrassment if they become disassembled while I am wearing them, I will let go of these attachments before they let go of me. 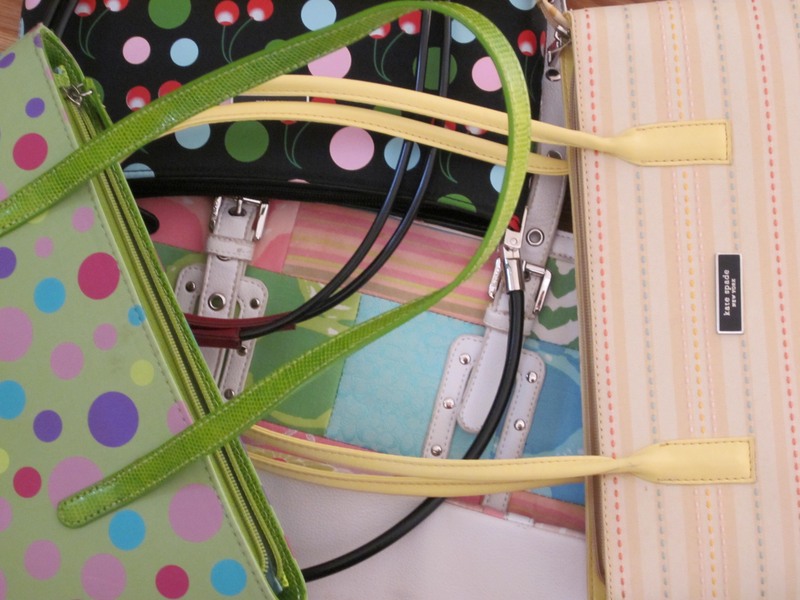 I am also trying to part with a collection of purses that have great sentimental value. They are reminders of an infamous visit with seven friends, or friends of friends, to a seedy, five-story firetrap in New York where we were locked into a single, windowless room (our entrance permitted only after the guide, a new friend from the street below, performed the secret knock), with a handful other shoppers and shelf after shelf of high quality designer bag knock-offs. We were able to complete our shopping before we heard a pounding on the door –not so secret — and noted a flipping of the light switch, allowing us to stand paralyzed in darkness for several minutes, giving us time to think about what we would say when the police raiders had arrived. The adventure ended when our captors scooted us out the door to the tune of “Get out, get out, get out of the building now,” and led us to the same stairs that the police, had they been coming, would have used to enter the building. Whatever the potential threat, it didn’t materialize and I was left with many beautiful purses. However, after four years of not using them because it’s too much of a hassle to change purses all the time, I’m ready to help them move on to the home of a more flexible purse lover, while also ridding myself of the evidence of my crime. This entry was posted in personal reflections and tagged personal reflections. Bookmark the permalink. I agree with you about clutter – it gets on my nerves so I get on my nerves when I allow myself to do it. A lot of the time it is just laziness that keeps me from getting rid of things. As for old clothes – if I haven’t worn them in 3 years I guess I won’t again – (however, I am now remembering that I still have the dress I bought when I retired 10 years ago – and have never worn since!) It’s time for me to send these things on to the Goodwill or some other used clothing place. Be thankful that in this comments section I can’t post the pictures (evidence #1) of the ordeal in NY. Silvia, aka the reporter that “published the news” about this “knock off” activity, in the NY Times.